Remember when candy often came in all sorts of fun novelty containers and wrappers? The kind that you'd be more likely to buy to get the toy container than you would to eat the candy? I don't know about you, but I miss those days. In the '80s and '90s, Topps and Fleer probably released the most candies this way, but many other companies did too. A trip down the candy aisle sometimes also felt like a trip down the toy aisle. I saved a bunch of candy containers and wrappers from those days, which are featured below. For this post, I'm just including examples with a weirdo or monster theme. To coincide with the 1986 movie version of Little Shop of Horrors, Topps released a trading card/sticker set as well as these little buggers, which are filled with candy pellets. As a kid I was obsessed with this movie and always wanted an Audrey II toy, but was a bit too young to have seen these in the store when they came out. 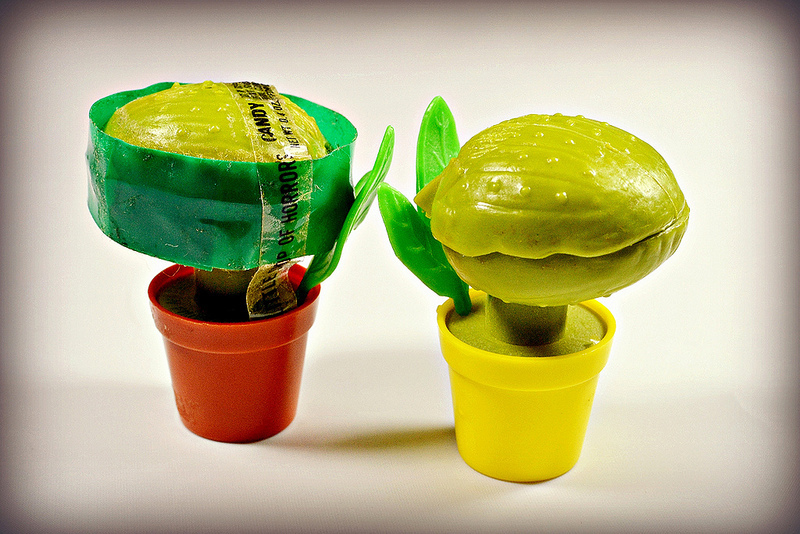 The design isn't too detailed, but these are still really cool, and I just love the fact that Audrey II candy containers exist. These fun little Mr. Bones candy-filled coffins were produced by Fleer for many years, starting in the late 1970s all the way up until the 1990s. The sweet tart-like candy that came inside were different bone-shaped pieces you could use to build a skeleton. 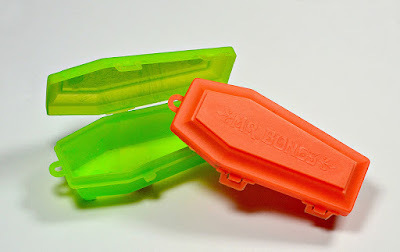 I had a little rubber skeleton I used to store in my coffins once I finished the candy. These things should still be sold today! 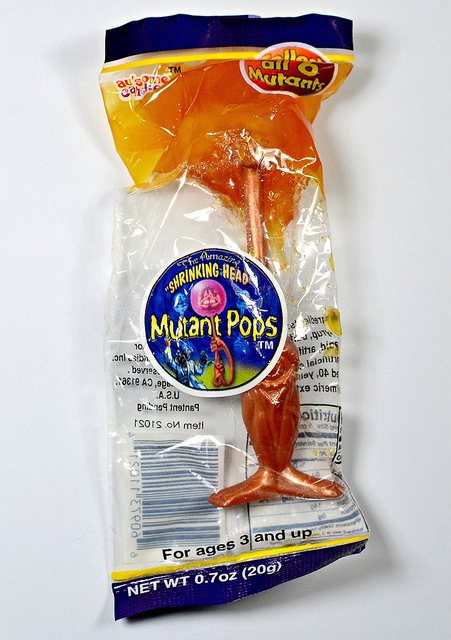 I haven't been able to get an exact ID for this one, but I remember getting it at a candy store in the late '80s. The head popped into a clear body that was filled with tiny multicolor candy balls. 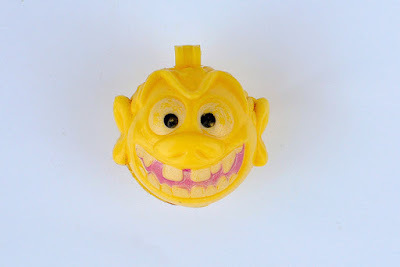 It looks to at least be inspired by Madballs, if not an official Madballs item. 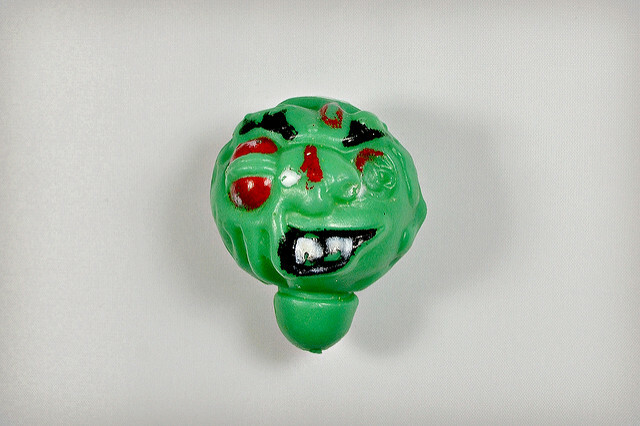 My guess would be a knockoff to capitalize on Madballs' popularity at the time. There were likely other designs available. I have also seen photos of other similar clear figure containers with removable heads based on different themes, like Halloween characters and aliens. Not many people seem to remember these. 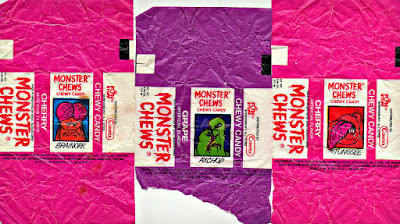 They were Laffy Taffy-like fruit chews, nothing too special flavor-wise. What made them great were their wrappers, which featured different bizarro monsters. I remember going to a local pharmacy and buying these all the time for a penny each, trying to collect as many different monsters as I could. There were two different designs and sets of monsters, the first of which came out in the late '80s, and then a second batch from the early '90s. These designs shown here are from the later batch. 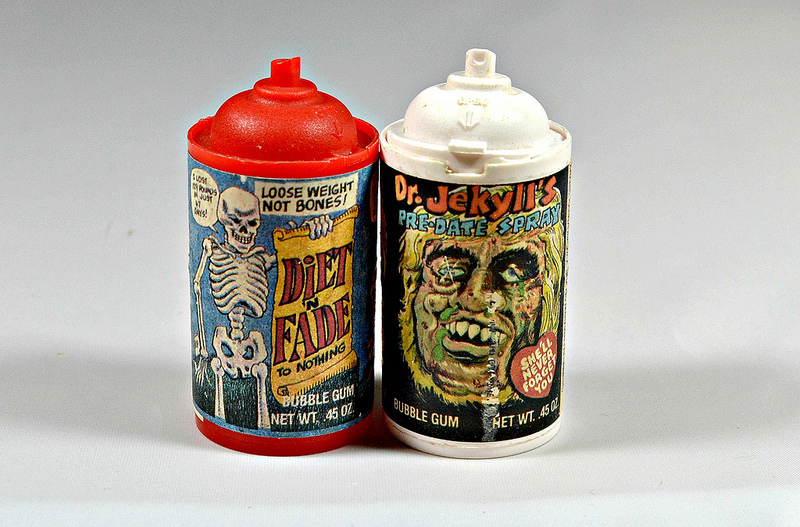 These were bubble gum containers featuring funny, irreverent artwork for made-up products. Sort of like Wacky Packages. There were 20 different designs. Monster heads like this one were released as toy accessories to Chupa Chups suckers, sometime in the mid-late 1990s. The idea is that you'd store your partially eaten sucker inside of it to finish later. The concept was kind of gross if you ask me, but at least the little monster heads were cool. 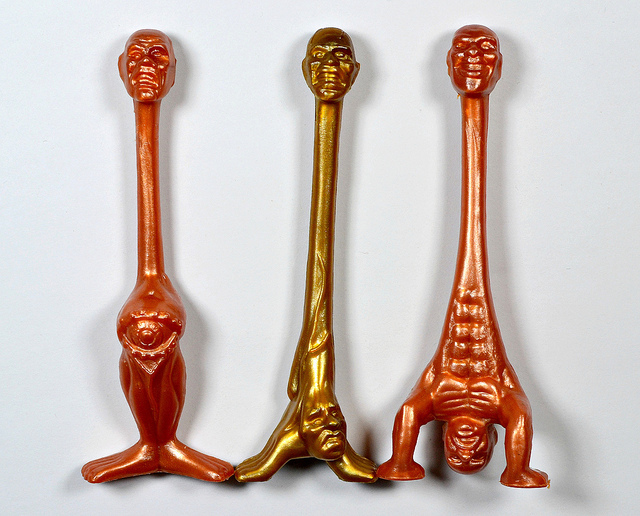 These probably take the cake for the creepiest candy-related toys ever. 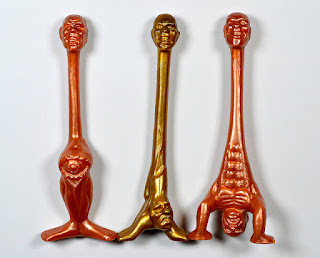 The release included six different plastic, freakish mutant-monsters that served as sticks to a candy sucker. The hard candy ball was around the creature's head, which I guess looked larger through the candy than it actually was. I got these when they came out in the late-'90s and saved one one in the package, but the candy started melting into a pile of goo so I recently set the figure free to join the other two opened upon buying them (of course, not before taking a photo of the packaged example). I think the figures came in silver in addition to the gold and bronze shown here. These are actually really awesome, and I'd definitely like to get a hold of the other three sculpts I don't have. 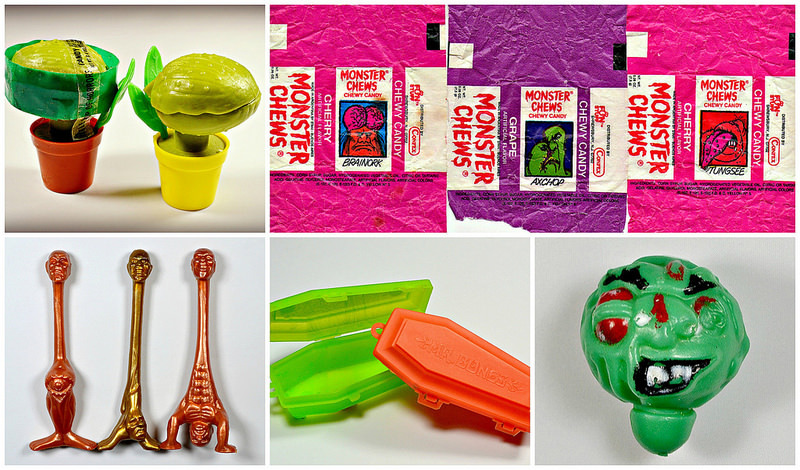 And there you go--just a small sampling of some weirdo candy-related toys and wrappers from years gone by. Are there any other good examples you can think of? Iv been trying to replace my set of the amazing shrinking head mutant pops for about 14 years. This is the closest I have came to since 2001 when I left mine behind when moving across country. I hadnt even been able to find a name for them till now! I had no idea what they were called until recently either. My packaged one was in storage for years and I'd forgotten I even had it. Then a few months ago I stumbled onto it randomly. Unfortunately you can't really search for these by name on eBay or anything so they're tough to find. The patron saint of helping figure out the identity of obscure and lost toys strikes again! Man I love these guys so much. I never saw them in stores, but I'm sure I would have grabbed a few if I did. In that time i wasn't actively collecting, but i would pick up cracker jacks every now and then for the prize. Though i think by then it was mostly paper junk as the "prize". I love the design of these because it's a clever way to get past the no toy in food law that has robbed the US of cool minis for some time now.